Thanksgiving is about family, good food and gathering together. It’s about being thankful for the abundant blessings we each have in our lives. It’s not about stressing over the details. (Just my opinion.) So with that in mind I came up with this boxwood and pine cone centerpiece for my Thanksgiving table that put itself together in less than 10 minutes. Add another 5 minutes for cutting the boxwood and call it done. 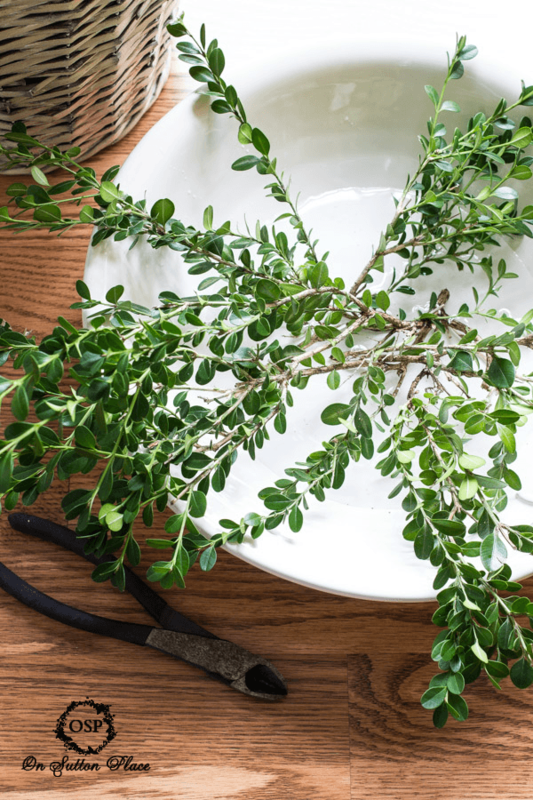 I began by cutting some boxwood branches from my bushes. 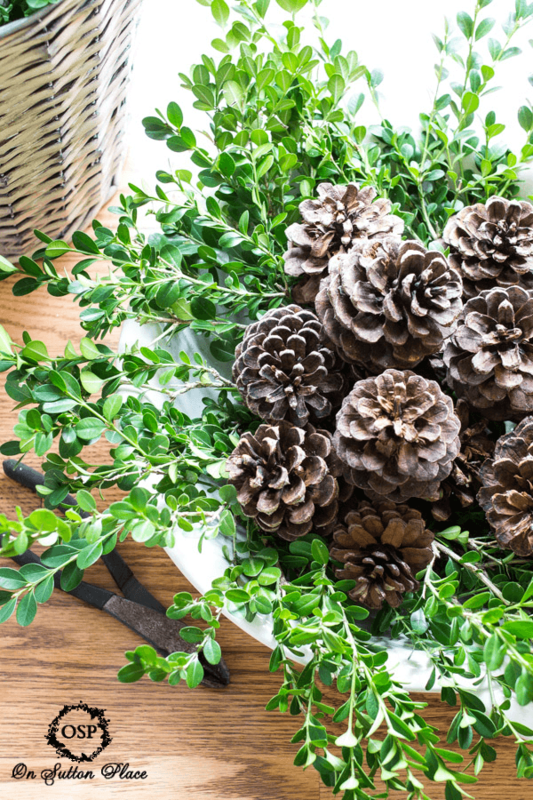 I gathered a low but large bowl and some pine cones. I added just a bit of water to the bowl then cut the boxwood so the stems laid in the center and the tips hung over the edge. 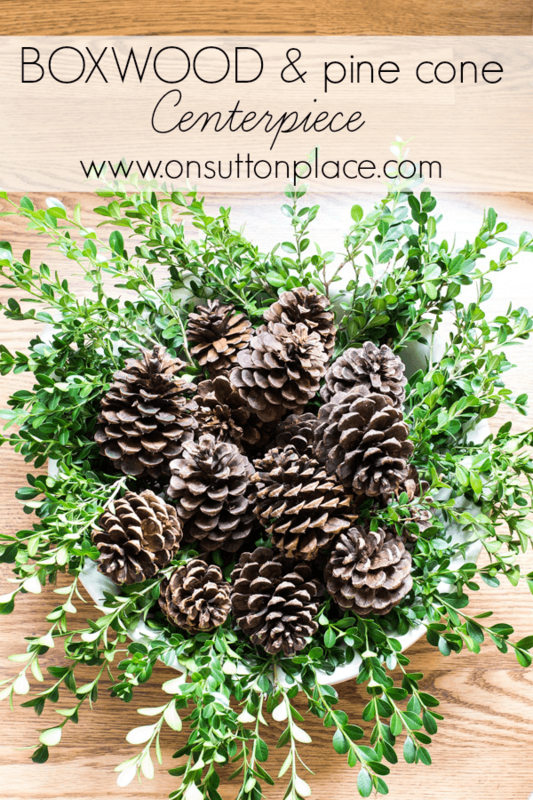 I kept adding branches until I had a full circle of greenery that was dense enough to hold the pine cones. I then started stacking the pine cones. Definitely not an exact science but try to pile the pine cones high enough so they are well above the rim of your bowl. I waited until it was on the table before adding more water. I really don’t know how long this will last. My guess is that it might hang in there for several weeks…maybe even until Christmas if I keep it watered. I hope so because I have a few ideas that will jazz it up for the holidays. I’m working hard at getting some Christmas items made for my Etsy shop. It’s going slower than I would like…I hoped to have some things listed by now. Time management is still not my best skill. Hope your week is off to a lovely start. I’ll be back in a day or so with a guest post by a darling blogger who’s sharing a pumpkin recipe. See you then! 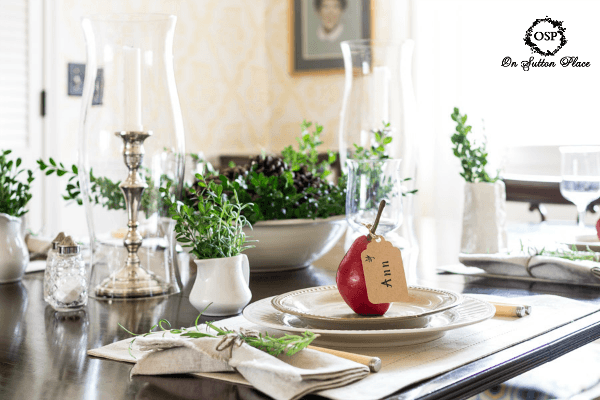 Click to see my Thanksgiving Tablescape 2012. I used boxwood in a totally different way. I love this and we have plenty of pine cones and boxwoods. I love that it is so simple and organic. Thanks for sharing. Beautiful! But, aghhhh , where do I get boxwood? Maybe I can find a bush around. Thanks! Lovely idea for a centerpiece. I’m going to copy this one. Thanks for sharing! I Love the simplicity of this arrangement, the contrast in texture is lovely and eye catching. A must do! It’s been my experience that when pine cones get damp they tend to close up. Would be interested in how yous hold up. Love it’s simple, natural beauty! Your arrangement with the boxwood and pinecones very pretty Ann. I can see some sparkle added to it for Christmas. I love all things fresh and natural. 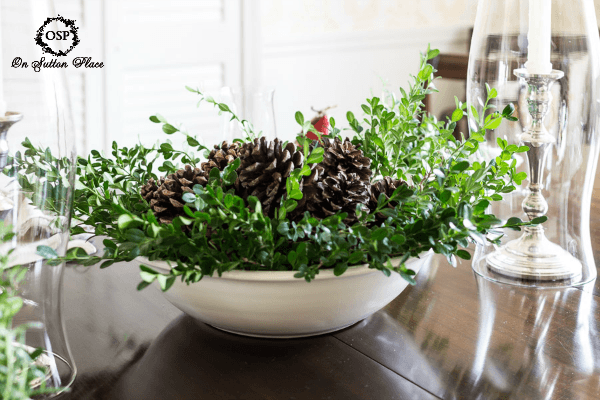 Your centerpiece has an elegant feel and your tablescape is very attractive. I finally got to bake your apple walnut bread and posted about it. It was delicious. My husband especially liked it. Beautiful! This reminds me that I really need to take advantage of boxwood inside more. You make it look so easy and effortless! Very pretty, Ann. Sometimes simple is the prettiest, I think. Ironically, I ordered some Christmas table linens that would match your centerpiece, so I will probably copy it! I saw a beautiful fresh boxwood wreath at a craft show several weeks ago. 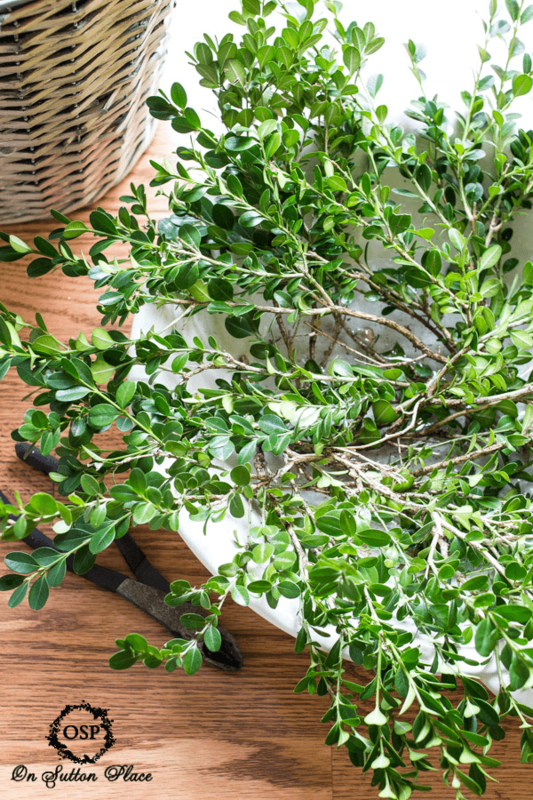 I may try my hand at creating a small boxwood wreath to hang on a mirror during our dinner, along with your boxwood center piece on our table. Enjoying all the bloggers’ beautiful tablescapes. So very elegant and pretty and it reminds me to plant some boxwood in the spring.